Nulty (Glenariffe) James (Roy) 7th February 2019, RIP. Peacefully at home, 86 Glenariffe Road. Beloved husband of Elizabeth (Lily), and darling daddy of Katrina. His remains will leave his late residence on Saturday, at 10.15am to arrive at St. Patrick's and St. Brigid's Church, Glenariffe, for 11am Requiem Mass. Burial afterwards in adjoining cemetery. Deeply regretted by his loving wife, daughter, son-in-law Hugh, grandchildren Mark, Anna and Josef and granddaughter-in-law Marianne, and great grandsons James and Hugh. St. Bosco pray for him. 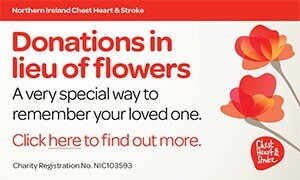 Family flowers only, donations in lieu if desired to NSPCC. I am sorry to tell you that James (Roy) Nulty has passed away.